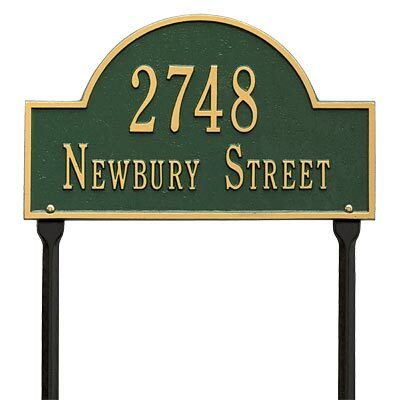 Distinguish your home from the others on your street with the Whitehall Arch Lawn Marker. The rectangular base and arched top add a classic look to the item. This durable recycled aluminum marker will surely last a lifetime and the numbers can never fall off as they are cast with each order. Customize the two lines with up to five 3" characters on the first line and up to seventeen 1.25" characters on the second line. This attractive, hand cast lawn marker will clearly display your address and personalized lines, year after year. The Whitehall Arch Lawn Marker may be installed using the included 18" ground anchors. Hand cast from recycled aluminum in the USA.